This book could easily be titled, “The Best of Walther,” because it contains his most significant essays outside of his well-known Law & Gospel and Church & Office books. All the essays are eminently relevant today. Walther’s writings on confessional subscription, doctrinal development, and the duties of a Lutheran synod are alone well worth the sticker price. I am particularly pleased that the 1868 essay “Syncretism” was included. In that piece, Walther explains what the LCMS has always meant by that term with quotes from the orthodox Lutheran fathers, including the classic explanation of “syncretism” by the irenic Johann W. Baier. Second only to the new edition of C. F. W. Walther’s Law and Gospel, this volume is indispensable for any student of the Holy Scriptures, the Lutheran Confessions, and the history of the confessing Church. The historic writings exhibited in this collection from Concordia Publishing House serve as sixteen canvases upon which Walther has artfully detailed what it means to faithfully confess Christ and His redeeming Word—all for the sake of the Church and her witness to a lost world. 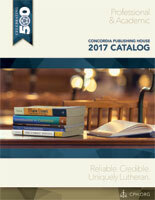 This collection does not serve as a memorial to Walther or a commemoration to Luther and the reformers but as a testament to the Word of Christ that the Church is given to confess—to heaven and to the faithful and to a dying world. C. F. W. Walther’s Law and Gospel elucidates the Church’s faithful confession from the pulpit; this volume clearly details the foundation of true Christian fellowship: the Church’s faithful confession of Christ and His Word from pulpit and altar. These essays of C. F. W. Walther set forth the Confessional Lutheran approach to church fellowship and the role it plays in Communion fellowship of the Lord’s Supper. He carefully and uncompromisingly explains the insistence on fidelity to doctrine based on Scripture and traces its close relationship to unconditional confessional subscription and to church life and the spiritual welfare of believers. English versions of these essays have been available in scattered sources but are conveniently gathered here and provided with a Scripture index for use in examining the basis of their assertions in God’s Word. In postmodern times, it is fashionable for many in the Church to question and even to mock the idea that we can be certain about doctrine. To insist on doctrinal uniformity is uncharitable, impractical, and even un-Christian, it is argued. These writings of Walther reveal that such voices in the Church are anything but new, and Walther takes them head-on. The question he poses as the theme of one essay—“Do We Draw the Lines of Fellowship Too Narrowly?”—captures the theme of the volume. In answer, his essays hold together three convictions: the “it is enough” of the Gospel (AC VII), the necessity of agreement “in doctrine and in all its articles and . . . the holy sacraments” (FC X), and the sufficiency of Holy Scripture as the sole basis for all doctrine (and doctrinal certainty). Walther’s voice gives us a window into nineteenth century Lutheranism and counsel for confessional integrity in the twenty-first. The key theological issue discussed during the formation of the Synodical Conference of North America and when the Conference was being dissolved was the degree of doctrinal unity necessary for church fellowship. In the debates of the twentieth century, both sides felt that they were following the principles established by Walther during the time when boundaries were being sorted out in American Lutheranism. This collection of important works on the subject from the pen of Walther will be a useful resource for establishing what his position really was and assessing how well it is being followed by his successors today.